The Stable Moments program seeks to improve the quality of life for those foster and adoptive youth in our community. 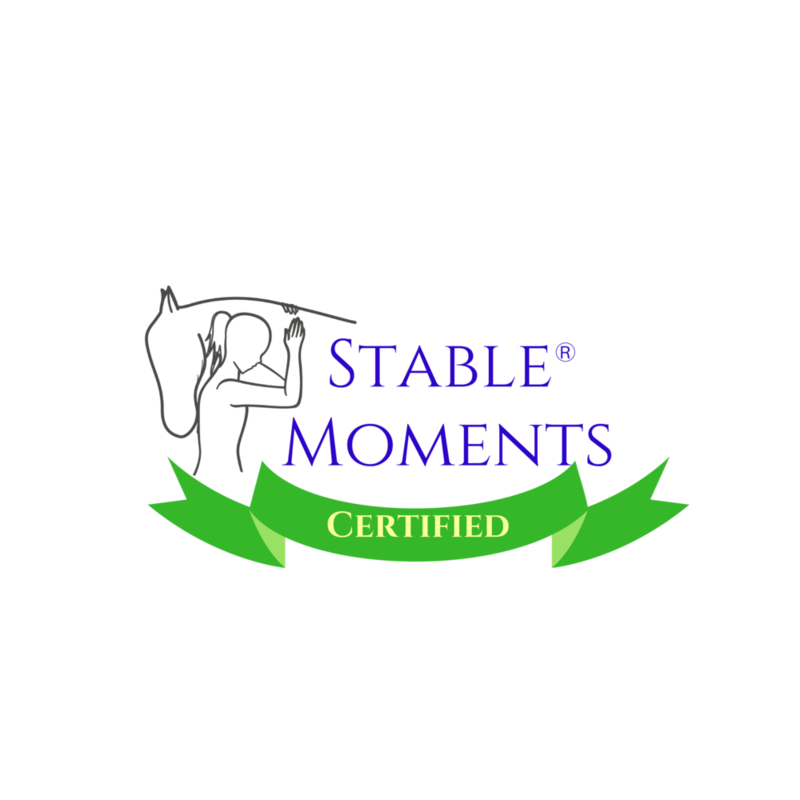 Stable Moments pairs one participant with one horse and one mentor for 10 months. For an hour per week, this team works on equine facilitated learning activities. Teaching these children how to communicate with their horse through body language, energy and pressure lets them develop a greater capacity for empathy, social- and self-awareness. As these youth get comfortable in their routine with their mentors and horse, their willingness to apply themselves improves. This success eventually translates to home, school and community settings. Children who have suffered abuse and neglect have good reason to be untrusting of people, especially those in authority or care roles. For these children, the horse provides an alternative being with whom they can achieve a partnership through trust. This type of relationship—which is often foreign to these children—can be the beginning of building more stable connections with other humans, hence the name Stable Moments. The Stable Moments mentorship model runs through the school year August to May with open enrollment running May to December. Click the button to the right to learn more. High School Girls Summer camp is a great learning experience for all! The goal of this camp is to allow for connection with other girls, the outdoors, and their horse. Our hope is that each young woman leaves feeling rested, more aware, and empowered to move forward in life! Each camper will be assigned their horse for the week. Camp activities include creative projects, team building games, learning horse basics, caring for their horse, farm chores, ground training with their horse, and riding lessons. Slots are extremely limited. **DISCLAIMER: Our overnight camps are a true, challenging "camping" experience. Campers will be challenged with long, hot days with a lot of physical activity. Campers will sleep in the barn every night in a hammock and mosquito net. Adequate rest, privacy, and allotment for personal needs will be provided, however facilities are limited and we consider this part of the experience! Campers will not have access to cell phones and will be encouraged to "simplify" and "rough it" together! Our summer clinics are open to 12-18 year olds. Participants can sign up for morning session, afternoon session, or both! For those who sign up for both sessions, lunches must be packed and brought. Water and snacks will be provided during each session. All levels of learning are welcome. These clinics are ideal for young people interested in horses or those looking to go into the equine/agricultural field. Slots are extremely limited. If clinics fill up and participants are willing to work with a mini horse instead of a full size horse, we may expand our capacity. Come learn the basics of Natural Horsemanship, a training method based on trust and herd behaviors. Each participant will be assigned their own horse for the clinic and be responsible to care for their horse during their time on the farm. Beginners to advanced are welcome! We will work with each participant to add to their learning experience. Work with your assigned horse to learn the basics of grooming and horse care. Participants will learn skills such as applying a hoof pack, administering oral medications, taking vital signs, and more! Using natural horsemanship techniques, work with your assigned horse playing games!! Participants will use Parelli type games to build a relationship with their horse and learn training techniques. This clinic is best suited for those with horse experience but beginners are welcome! Learn equine science with your assigned horse! This clinic includes fun, hands-on learning activities and games that will teach the basics of equine anatomy, movement, breeds, colors, markings, nutrition, and more! All levels of learners are welcome!